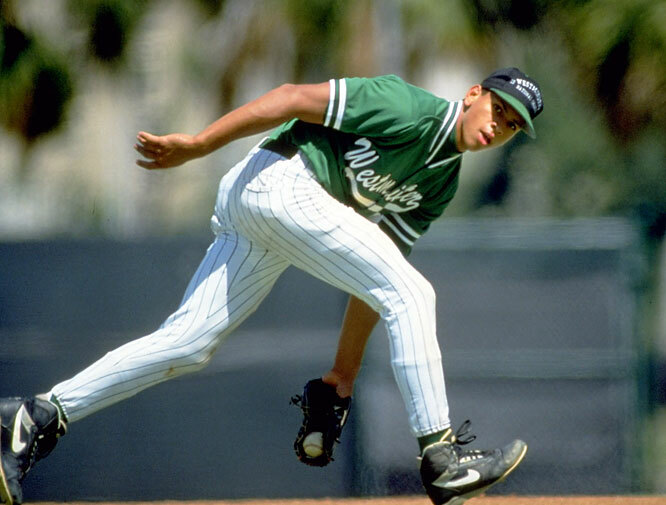 Alex Rodriguez never knew what being substandard meant. Nor did he ever know what being average meant. Everything in his life is excessive. His lifestyle, his ego, his baseball contracts, even his appearance is excessive. He lives in a world of believing he is the center of the sports universe. That he is a global celebrity more than just a baseball player. His early career made him a Superstar in Seattle, however being kept beneath the love and admiration of Ken Griffey Jr. Griffey was a superstar, but more than that he was a leader in the clubhouse and respected by the game. Alex could care less about being a good guy, he just cared about showing he was the best. He was great as a player in Seattle. Which led to the contract that made him the highest paid athlete in baseball at the time in 2001. Since that contract, it seems as though Alex Rodriguez made a deal with the devil. Though we can largely assume Alex Rodriguez has taken performance enhancing drugs throughout his big league career (including with Seattle) he claimed in 2009 to have taken steroids only from 2001-2003, the years in which he was at his best. From there came the Yankees in 2004, where the pressure and media focus became centered on him and the relationship with the beloved Derek Jeter, and how they would play together. Whether people believe it or not, Alex Rodriguez resented Jeter from the start, mainly for not bowing to his new teammate by offering him his position at shortstop, though many assume Jeter will rank among the all time best after he retires. Alex then went on to tank in the postseason, while Jeter would sizzle. Alex Rodriguez talks candidly about admiring his statistics. Jeter cares about next season and contending for a World Series Championship. That in essence, is what separates the two more than anything. And now with the Biogenesis case narrowing in on him, he continues to believe his ego and his celebrity will save him. He lives in his own reality. His recent appearance in public with hired Yankee fans confirms Alex wants the attention. He wants to see his name in the press. The belief that he can beat Major League Baseball, Federal, and possibly even the Supreme Court is absurd beyond all measures. He’s publicly criticized Bud Selig, saying, “He hates me, hates big contracts, and is trying to destroy me.” This very much is a comment that a third grader would say after being accused of cheating on a test. And therein lies the issue; Alex Rodriguez is a man-child. He’s never had to listen to anyone, and when he’s been accused of acting childish, his mentality has been to blame others before himself. Though the sports world is speculating his future, it remains imminent that Alex Rodriguez is done as a baseball player. He has gone all in on a bet that basically will confirm that he is a cheat and a liar, and furthermore confirm that he never rightfully should have been given that massive contract over a decade ago. Alex can deny all he wants, but he will have to face the music very soon. He’s a rich man no matter what, so the media and his teammates will have no sympathy for him. He will never make the Hall of Fame, never make the discussion of best shortstop, best baseball player ever, none of that. He will go down in history as a fraud and a cheat, more so because he never told the truth, or at least the whole truth ever in his life. It’s a sad story, but one that could have been avoided if Alex Rodriguez was just a good player in Seattle. A guy that didn’t seek to gain attention by taking PED’s, didn’t aggressively seek attention out in public, and didn’t alienate his teammates. But he won’t. And even his lawyers that he pays heavily for can’t convince him he’s wrong, which has led to his appearances in the press trying to clear his name. His name unfortunately, will be known forever as being one of the biggest liars in baseball history. But his lie was far bigger than Pete Rose’s about gambling. He swindled organizations, players, managers and many others in the game of baseball for who he was. And now he must face the inevitable. He has played his last game in professional baseball.